18F-GP1, a novel positron emission tomography (PET) tracer for imaging acute venous thromboembolism (VTE), is safe and effective, according to results of the first human study, which were reported in the February 2019 issue of the Journal of Nuclear Medicine. PET/computed tomography (CT) scans using the tracer had excellent image quality, a high detection rate for the diagnosis of VTE, and identified blood clots in distal veins below the knee. Conducted at the Asan Medical Center of the University of Ulsan College of Medicine in Seoul, Republic of Korea, the prospective, proof-of-concept study investigated the detection rate of thromboembolic foci with 18F-GP1 PET/CT in patients with acute VTE, and assessed its safety, biodistribution, pharmacokinetics, and metabolism. Because 18F-GP1 targets an intrinsic pathologic molecular event in thrombus formation, acute thromboemboli within the entire body may be detected without a contrast medium. For the study, 20 patients were enrolled, 10 with acute DVT and 10 with pulmonary embolism (PE). Before undergoing the PET/CT scan, the patients had CT venography, CT pulmonary angiography, or ultrasonography. These exams identified PE in five DVT patients and DVTs in seven PE patients. Altogether, DVT was identified in 76 veins of 17 patients and PE in 245 pulmonary artery territories of 15 patients. Chanwoo Kim, MD, of the Asan Medical Center’s Department of Nuclear Medicine, and co-authors reported that none of the patients had adverse events and that all tolerated the radiotracer and the scan without incident. The authors reported that kidney, spleen, and blood-pool activities showed a high initial uptake followed by gradual washout. DVT and PE demonstrated rapid initial accumulation followed by plateau phase, with minimal decrease of activity until 120 minutes following the 18F-GP1 injection. Images acquired at 120 minutes were used for the analysis. The researchers identified thromboembolic foci in 10 patients with acute DVT and 10 patients with acute PE. When analyzed, the tracer revealed DVT in 16 of the 17 patients and PE in all 15 patients. One false-negative result was located in the muscular vein of the calf from a patient with dyspnea and chest discomfort one week following a total-knee arthroplasty. 18F-GP1 PET/CT and CT images of a 55-year old man with DVT and PE. (A) Anterior maximum-intensity projections of 18F-GP1 PET/CT over 120 minutes show positive 18F-GP1 accumulation in pulmonary arteries (arrows) and in proximal (dotted arrows) and distal (arrowheads) veins of leg, which are gradually distinct on late images as 18F-GP1 activity from other organs is excreted via both urinary and hepatobiliary tracts. (B-D) Transaxial CT images (left) clearly show pulmonary emboli in right main and left lower lobar pulmonary arteries (B, arrows) and thrombus in right popliteal vein (C, dotted arrow). Positive 18F-GP1 uptake (right) at 120 minutes after injection is seen at corresponding vessels (B and C, solid and dotted arrows, respectively). Additional positive 18F-GP1 uptake (right) is observed in left peroneal and gastrocnemius veins (D, arrowheads) but no corresponding filing defects are seen on CT venography (D, left). Images courtesy of The Journal of Nuclear Medicine. The vessel-based detection rate was significantly lower in PE than DVT, which the authors speculate may have occurred because the age of the PE may have been older than two months when the scan was performed. The authors suggested that increased uptake in distal veins of the legs should be the subject of additional research to determine the tracer’s diagnostic accuracy and utility compared to conventional imaging. 18F-GP1 PET/CT should also be studied to determine if it can help differentiate acute VTE from chronic VTE based on the results of a positive correlation between 18F-GP1 uptake and P-selectin-positive platelets obtained in this study. Kim C, Lee JS, Han Y, et al. Glycoprotein IIb/IIIa receptor imaging with 18F-GP1 PET/CT for acute venous thromboembolism: An open-label, nonrandomized, Phase 1 Study. J Nucl Med. 2019; 60:244-249. 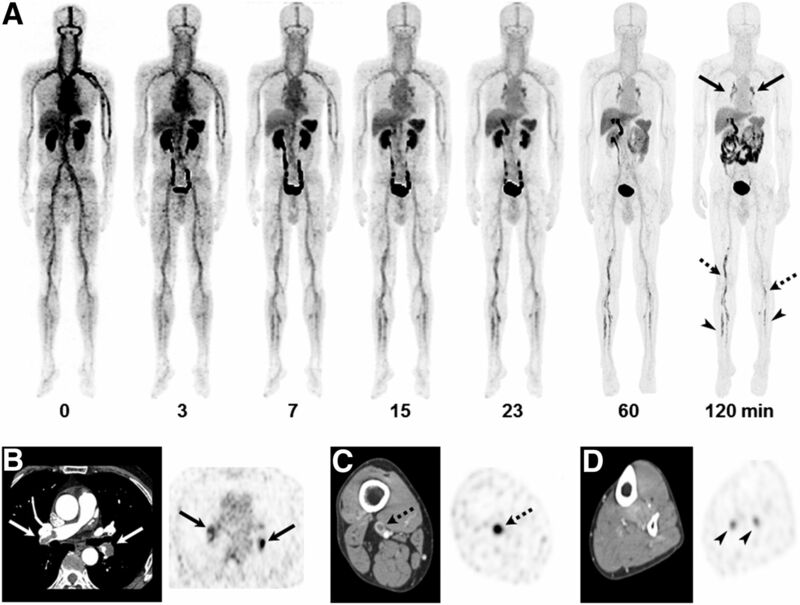 Novel PET/CT imaging agent for acute venous thromboembolism is safe and effective. Appl Radiol.